← A new video for “KC s2M+MC” plugin – installation, update and settings guide. Skip to "License and download". Do you wish your members' levels and ccaps information from s2Member® was also available in Active Campaign as tags? This tool is what you are looking for. Since there is no native integration between s2Member® and Active Campaign this tool was needed to synchronize them (it also synchronizes OptimizeMember inside OptimizePress). At this point, it works only with one list, and converts your s2Member® levels and ccaps into Active Campaign tags. 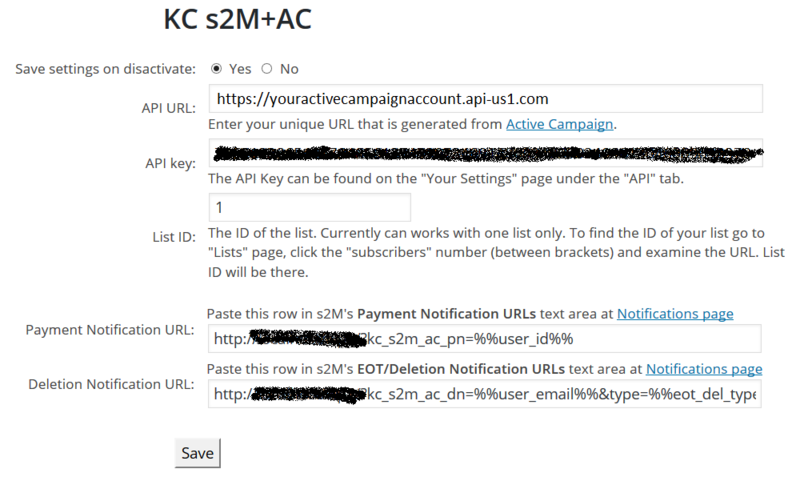 This means that when a new member joins your site, or an existing account is updated (by an admin or the member themselves), the plugin sends the information (email, first name and last name) to your Active Campaign list (with his ccaps, if any, and with his s2M level). The plugin cares only about the list you set in the plugin's options (not s2M options). It eliminates the needs of any AC forms and corresponding plugins. Actually, it uses the WP and s2M login forms to collect the member's information. Synchronization is possible only "from s2Member to Active Campaign". This means that when the member in your Active Campaign list changes his email, or a new member joins the list, the plugin can't create a new member in your s2M powered site. But when a new member joins the site, the plugin will add him to your AC list. Synchronization is done each time when member's account is created or updated, include when the member resets his password. If a member unsubscribes from a list, his site's account will stay; it will not be updated or deleted. In addition, the next time the site's account is updated, the plugin will put this member back to the list. You need to set a few options. You will need to find some values in your Active Campaign account. Follow the instructions on the admin page. You also need to set two notification URLs in the s2Member options. The instructions are also on the page. Once the options are set, you don't need to do anything else; the plugin will do the work for you. I will be happy to answer any questions, please ask me. Short explanation of license: Perpetual License with 12 Months Support. You buy "allowed domains" number (not installations, on one domain you can have several sites), with one year updates, bugfixes, training, installation help. When the year passes your plugin will works, if no significant changes in WordPress®, s2Member® and Active Campaign. Also you get lifetime discount for any other products of mine. Additionally, we will set discount for all new features you may need. Also I would like to share my revenue with you. Welcome to my Affiliate program. 1 30 USD You must log in or create account to purchase this product. This entry was posted in WordPress plugins, WP+s2M plugins and tagged AC, Active Campaign, bridge, ccap, ccaps, email, integrate, integration, list, lists, mail, mail info, mailing list, member, members, members info, s2m, s2member, synchronization, synchronize, tag, tags, tool, transparent. Bookmark the permalink. Yes, that is exactly what I need. The tag feature is excelent because I can start adding people to different list using just tags. that´s great.